I’ve recently come across this neath application on Facebook, it’s called Cities I’ve Visited. Indeed; I’ve traveled quite a bit during the last few years for work and it would have been great to have something like that back then. French people generally “try to speak englisch”! The sign is displayed on the door to a “boulangerie” (bakery) and obviously is a call for the hungry tourist to come in and enjoy the region’s specialty. Although you can also find “calissons” which are not specially typical of the region in there too. Anyway, I think the sing says it all. Geraardsbergen (Grammont in french) is a very interesting city in Belgium. Located not far from Brussels (40 minutes car ride), it is the host of one of the most famous Belgian history statues: Manneken Pis. Of course; you’ll say that the Manneken Pis is located near the Grand Place of Brussels and you’d be right on this remark but there is also a statue in Geraardsbergen. This is the oldest one known in Belgium and is located in a much more quiet place in Belgium where you can enjoy the nice city “ambiance”. 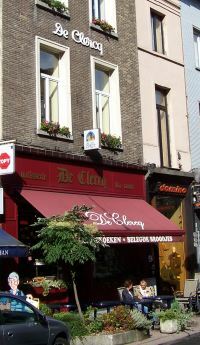 While you visit the city, you might want to go into the De Clerq bakery! The place is charming and well decorated, the food is great and there are some tables on which you can accommodate in order to quietly enjoy the afternoon. A little east of Montpellier, between Uzès and Nimes is the Pont du Gard. This bridge built by the Romans was used as both a road bridge and aqueduct between these two cities. It is the theater of many cultural events as well as a recreational place during summer! At some point in time, people used to dive from it until it was forbidden a few years ago. A nice little restaurant in Uccle (Brussels). Located in a quiet section of the Uccle “commune”, just next to the Kauwberg which is one of the most important “green space reservoir” of Brussels in which you can enjoy a great after meal “promenade”. The Ventre Saint Gris’ experience was excellent overall, having booked in advance made it easy for the owner to accommodate our 20 persons group. The timing was good, the waiting time between ordering and being served was really amazingly fast while the quality of the servings as well as the quantity was great. A very nice experience where you can’t be disapointed, the menu is very dynamic so be sure to check their website where you’ll find all the details. If you’re looking for a nice little Italian restaurant in southern France, the Piazza Papa is certainly a good choice. Located in the center of Toulouse, the chain has two other places in Montpellier and Aix en Provence. I only know the Toulouse’s place. Apart from a calid ambiance, the waiters are always very nice and let you take your time. The food is great! I specially recommend the salmone calzone as a starter followed by the salmone pizza, but that’s just because I love salmon on a pizza! Be sure to try the Café Liégois for desert, it’s one of the best Café Liégois that I’ve ever tasted! It is not the first time I speak of the French Pays Cathare. In fact, about a month ago, I wrote something about Carcassonne which is the Pays Cathare’s most impressive city. However, Medieval cities are all over the place in Souh-West France and Mirepoix is another example of such. Mirepoix is located in the French Ariège département, about an hour south of Toulouse in the direction of Foix. It is much smaller than Carcassonne but has much to offer to its visitor. In south-western France, a little north of Cahors, located at the border of the French Midi-Pyrénées and Limousin regions, more specifically at the border of the Lot and the Corrèze department, lies the French Quercy, more specifically the Haut Quercy (high Quercy). This former region of France which was home of the Cadurques Gauls is very rich in Limestone. The architecture and colors that can be seen in this region are a testimony of this natural resource’s presence.